CC5 was created in Amsterdam in 2006 by the saxophonist Christine Corvisier who composes a modern progressive jazz repertoire for it. In the same time energetic and lyrical, this band really leaves a special and original footprint in the current jazz scene, not only of Cologne where they are located but also in France (Paris, the French Riviera), Monaco, Luxemburg and the Netherlands. They recorded a first demo in June 2006 called Melting Pot and released their 1st album „Walking Around (EBF)“ in may 2008.Their new album „Reconnaissance“ will be released in october 2015 by the swiss label „Unit Records“. After her studies (1st prize „DEM“ at the „Conservatoire de Nice“ – France – and „Bachelor of Jazz“ at the international „Conservatorium van Amsterdam“ – Netherlands) She quickly made a name for herself in the jazz scene of Benelux, France and Germany where she frequently plays concerts with various projects. In 2008 she won the Price „Young Talent of Alpes Maritimes“ and released her first album „Walking Around“. During a trip to New York in 2009 she had lessons with saxophone masters like – among others – Joshua Redman, Chris Cheek, George Garzone, David Binney, Donny McCaslin which considerably accelerated her musical developpement. 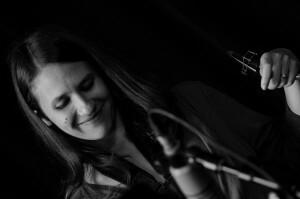 After she moved to Germany in 2010 she founded a new quintet with some of the best musicians of the Cologne jazz scene. She was quickly recognized beyond the borders of the region as a virtuosic but at the same time melodic improviser and composer. 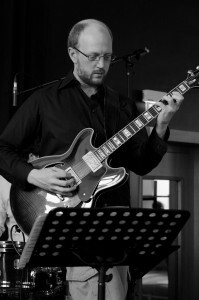 Cologne based guitarist Martin Schulte (*1979) is one of the most asked-for guitar players of the jazz scene in Western Germany. With his guitar rifts, this “brilliant instrumentalist” (Westdeutsche Zeitung), traverses the spaces between modern jazz, rock and funk. Sebastian Scobel was born 1987 in Dresden. Raised in a family of musicians he started playing the piano at the age of six and attended the Heinrich-Schütz-Conservatory Dresden. He continued his studies of both classical and jazz piano at the Saxon State College of Music. 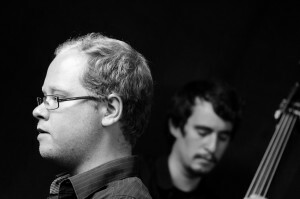 In 2007 Sebastian won the German Youth Jazz Award as best soloist as well as best group performance with his quartet „flaura & phona“, which included a CD-recording at the Deutschlandfunk (German Broadcasting). Since 2008 Sebastian lives in Cologne, where he studies jazz piano and Arrangement at the University of Music with Hubert Nuss, Florian Ross, Prof. Joachim Ullrich and Prof. Sebastian Sternal. Additionally he attended master classes with Simon Nabatov, Jim McNeely, Norma Winstone, Jürgen Friedrich and others. Sebastian was a member of the German Youth Jazz Orchestra (directed by Jiggs Whigham) from 2012-2013 and is winner of the „Steinway Price Jazz“ Northrhine-Westphalia 2013. He is the founder of the „Island H. Jazz Orchestra“ and member of various bands such as „Scobel-Kühnemann-Sauerborn“ (Piano-Trio), „Mengamo Trio“ (Hammond-Organ-Trio) and the „Filippa Gojo Quartet“. 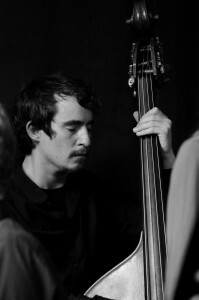 David Andres (1984, Saarbrücken) plays double bass as well as electric bass and lives in Cologne, Germany. Despite his young age, he already played concerts in almost every European country – a.o. at renowned Jazzfestivals like North Sea Jazz. As a soloist, he was awarded first prize at the Jazzfestival Czestochowa (PL) in 2011 and in 2015 he won the first prize in the renowned „Neuer Deutscher Jazzpreis“ competition with the quartet of Filippa Gojo. Besides playing concerts, he works as a teacher for double and electric bass and ensembles. In September 2011, he finished his studies at the Cologne Conservatory of Music where he studied with Dieter Manderscheid, Michael Gustorff and Marius Goldhammer. His playing can be heard on several recordings, that have been published on CD in the last years. Being invited by the Goethe Institut, he toured the Philippines and Palau in October 2011 with „The Willit Blend“ and „Hot Brownies“. Born in 1987 He studied music and composition at the International Conservatory of Amsterdam, Conservatory of Cologne and with the “DAAD Scholarship” he got the opportunity to make a Master of Musical Study at the Rhythmic Music Conservatory of Copenhagen. Through his european experience Thomas Sauerborn developped his own style, creativity and technique: he belongs to this minority of drummers who always serve the music by an extreme sensitive musical and awarness. 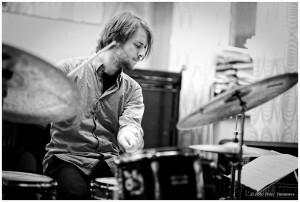 He won several prices like the first price of „Jugend Jazzt“(national Competition), the „JazzMe“ award and became the drummer of the „Bundes Jazz Orchester „(National jazz orchestra) in 2010. Currently based in Cologne he is composing, recording and especially touring a lot (China, the Philippines, Palau, Syria, Lebanon, Jordan, Palestine, South Korea, Vietnam, France, Lithuania, Belgium, the Netherlands, USA, Benin and Denmark) with many different artists and with its own projects. During the last years he got the opportunity to play with amazing musicians like Gwilym Simcock, Herb Geller, New York Voices, Jeff Cascaro, Glenn Miller Orchestra, Paul Heller, Claudio Roditi, Jiggs Wigham and many more.